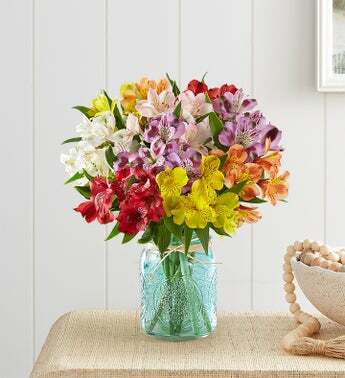 Our beautiful jewel-toned Peruvian lilies are a perfect surprise for someone precious to you. Send an abundant bouquet of 50 blooms, or choose a deluxe bouquet overflowing with 100 lovely blooms! Pitcher reads: "Sweet Garden / your dream is like a garden / your thoughts are the seeds, / your whispers are the water, / the sun grows your flowers"